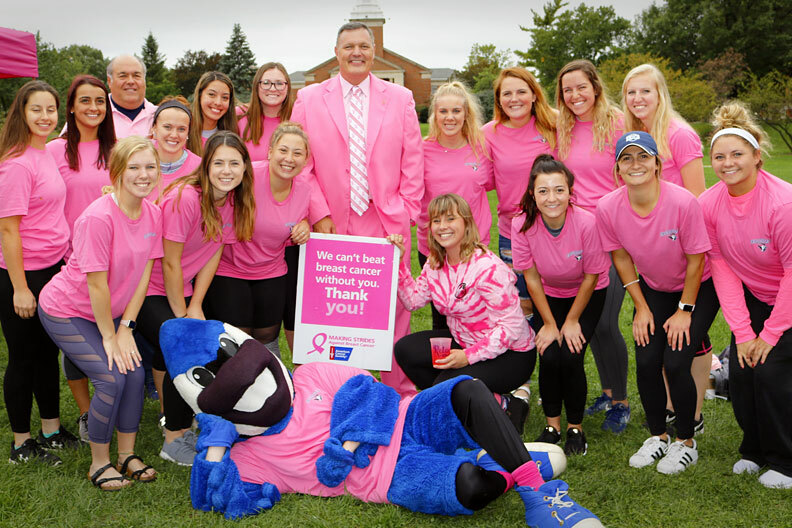 The Elmhurst College community marked the start of Breast Cancer Awareness Month by coming together on Tuesday, Oct. 2, to kick off Real Bluejays Wear Pink, a monthlong, campuswide campaign to raise awareness and funds in the fight against breast cancer. Led by Elmhurst College President Troy D. VanAken and Vice President for Student Affairs Phil Riordan, a cancer survivor, Real Bluejays Wear Pink will engage Elmhurst College students, faculty and staff throughout October in events and activities like a Pink Pumpkin Party, Pink Fridays and pink-themed athletic contests. Practically glowing in a hot pink suit and shoes, President VanAken spoke on Tuesday about losing his mother to breast cancer in 2002. He encouraged the hundreds of students, faculty and staff attending the kickoff party to enjoy the activities, but also to consider donating to the cause. Any donation will make a difference, he said. It’s something I encourage you all to do, as we have fun and celebrate the advances being made, but also contribute toward the advances that can be made. Real Bluejays Wear Pink is the College’s version of the American Cancer Society’s Real Men Wear Pink campaign. President VanAken is one of 20 community leaders in DuPage County participating in Real Men Wear Pink, which is raising awareness and money to support the American Cancer Society’s mission. Real Men Wear Pink also highlights the role of men—as caregivers, sons, fathers, brothers, husbands, as well as patients—in the breast cancer battle. Other Real Bluejays Wear Pink activities include the Campuswide Pink-Out on Thursday, Oct. 25, when students, faculty and staff will gather on the Mall to form a human pink ribbon. And that evening, E! News anchor Giuliana Rancic and her entrepreneur husband, Bill, will come to campus to present In Sickness and in Health … A Love Story. During the lecture, which is open to the public, the Rancics will discuss Giuliana’s breast cancer diagnosis seven years ago and its impact on their lives.